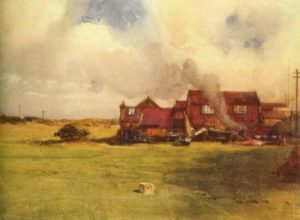 AHT started competing in the Open Championship in 1894 at Royal St. George’s (Sandwich), the first time it was played outside Scotland, finishing fourth and leaving illustrious names like Vardon, Braid, Ball, Herd and Fernie in his wake. However this would be AHT’s best performance as he finished ninth, seventeenth and twenty-second in the following three years. A new addition to the family meant he could ill afford the time needed to play tournament golf and concentrated on his bread and butter job as a club professional. AHT had taken up appointments at the following golf clubs; Eltham Warren (1893-1895), Minchinhampton (1895-1900), Headingly, Leeds (1900-1902), West Essex Golf Club (1902-1907), Tramore (1907-1909) and finally Beckenham, Kent (1909-1911). Testament to his ability as a golfer, despite being referred to a journeyman, was highlighted at an exhibition match at Rockford Hall, in 1904 when he defeated Harry Vardon, James Braid, and Jack White (the reigning Open champion). 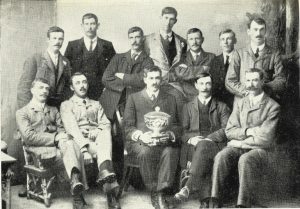 Irish International team who played Scotland for the Springvale Bowl in 1907 prior to the inaugural Irish Professional Championship. Note: Tramore centenary indicates 1906 was the year of appointment but AHT was still entering competitions as a West Essex player in 1907. Toogood would become a cropper when he tried to disprove the “eye on the ball theory” with an exhibition of blindfold golf. As expected his attempts to disprove the theory went spectacularly wrong.